In 2012, the Palisades Dolphins reached the US Lacrosse Southern Section title game. Since then, they haven’t been able to advance beyond the round of 16. With a roster full of returning players, including most of last year’s starters, second-year coach Kevin Donovan is looking to get over that hump in 2017. D-poles David Pairs and Cooper Lee (Colorado College) wreaked havoc last year with their athleticism and ability to cover other teams’ best players. They both had the ability to change the momentum with a big play, which helped lead to our 16-3 record. I will be looking for some of our younger, talented defensemen, such as sophomore Kyle Lee, junior Martin Avila and junior Liam Mathers to step up to fill their roles on the defensive side. Macchio Rissone, junior attackman and captain, will lead the offense, coming off a plus 100-point season with an offense that avg. 12.4 goals per game in 2016. Junior Jake Takakjian and sophomore Jack O’Rourke will also play a major role in the offense as they both have the ability to come in as a offensive midfielder or play attack. We have 12 seniors in our 2017 class, which makes up the core of our team. The senior group will be led by our captain, defensemen Noah Robinson. Our success relies on the leadership and commitment of our seniors, who add a lot of depth and talent to our team. Our number of returning starters: Ten out of 11 starters return, and we have 12 seniors and 20 total returning varsity players, which give us a strong core looking ahead to 2017. As mentioned, our seniors are the key to our success and how they decide to lead this team, but we also have 4-5 young guns that need to take the next step in their game to compete with the top 10. The biggest question mark will be our defense, as we have multiple players who can start, but we need to find the right combo and have our goalie, senior Spencer Au, continue to become the leader of our defense if we will have success on that side of the ball. One wildcard is our face-off position and the heart of our team — Brandon Kay, aka “BK All Day,” as the kids like to chant from the sidelines. BK continues to develop, but if he plays to his potential, he will give our potent offense key possessions in big games and help us control the pace of play. I am excited to announce that Will Manning will be joining the staff as a co-head Coach and our defensive coordinator. Will is from Garden City, Long Island, and brings an incredible presence and defensive IQ. Will currently coaches and runs the Santa Monica Dragons program while completing his student teaching hours, after recently coaching Division III and graduating with his masters in education at Whittier. I have played against Will my entire career, starting back when he played for the Long Island Empire team in summer ball, and then eventually in college, where he started at close defense at Colgate University (Patriot league), and I played at Lehigh University. I only recently met him last summer, coaching at 3d and with both of us living in Venice, but this past summer we created the SM Dragons High School program, and now he is jumping on board at Pali with me. I’m confident we can use our IQ and schemes to allow us to compete at the highest level this spring, and regardless of the outcome we are ready to have some fun at Pali in 2017. Although 2016 was a solid step forward in building the program and establishing a culture, we had a relatively weak schedule. In 2017 we are looking to challenge ourselves by playing seven teams ranked in the Top 15 last year, with a strong test against a well coached team in Chaminade as our home opener on Feb. 25. We have 20 returning varsity players, a new addition to our staff and re-energized feeling in the program. I strongly believe we have a great opportunity to make the playoffs and hopefully go deeper in 2017. 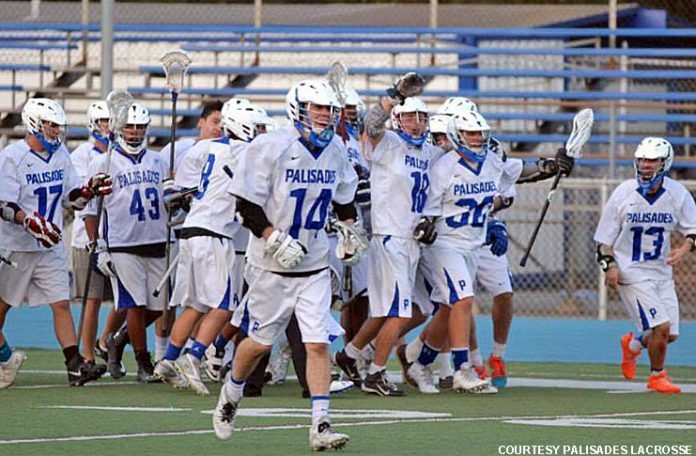 Our main goal is continue to build the program and create a winning culture at Pali, where kids want to play here and develop into young men during their four years in the program.